Who is it for? Nykaa Serial Kisser Lip Balm Grape is a tint-less nourishing lip balm for dry chapped lips. If you love grape soda then this one is a must! This lip balm comes with a cute looking round bullet with wavy patterns all over the lid. The body of the bullet is colored in pastel lavender. The packaging is quite an eye-candy I must say! The packaging is quite secure and sturdy; I have had no problem to carry this tiny bullet in my purse. The patterns might wear off with regular use. It is a colorless lip balm. It gives a completely transparent finish with no whitish cast. The texture of this lip balm is smooth and creamy. It is not a greasy lip balm. Overall it’s a good lip balm for everyday use. It does not come with SPF so it might not be your best lip balm for daytime. It has a sweet fragrance of grapes. It reminds me of grape flavored sodas you get at soda-pubs. The fragrance is light and does not stay long. 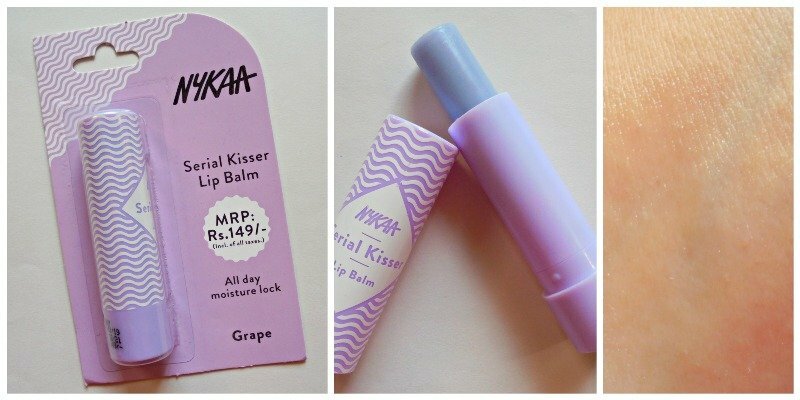 I have tried more than half of Nykaa’s new Serial Kisser collection lip balms. Every one of the variants has the same formula just their fragrances are different. Now this one is quite good in terms of moisturizing capability. It gives light shine to the lips and over regular use helps to cure dryness. This lip balm works nicely under the extremely dry finish lipsticks. It helps them to stay moist for longer. It’s a good quality moisturizing lip balm. It smells good and caters dry lip issues. It is worthy of a repurchase. If you want an affordable transparent lip balm, this one might get a shot.